"Double your production and halve your costs"
A new look at the old ways of gardening and farming without digging, spraying or fertilising. I've known Gresham, the author, for nearly twenty years since we worked together for GEC Telecommunications in County Durham. He is well-travelled, extremely knowledgeable and always has new ideas about everything. In fact, despite his advancing years (he's now in his seventies), Gresham still has the questioning outlook of a ten-year-old. Always keen to discover new things, try out new ideas. Seldom accepting statements like: "we've always done it this way." So, when he and his wife moved into a large house on top of a hill in North Yorkshire, he started to question the way that things had been done there. The house was centuries old and needed continual maintenance work to keep the heat in and the rain out! This work left very little time for gardening but good quality food was a priority. In this book, Gresham describes how he was able to grow superb vegetables and fruit in suitably large quantities in a way that was environmentally friendly and required the minimum amount of money and labour. You can easily copy his methods, whether you have 100 acres or a plant pot on the window sill. All you have to do is less work! I've dined with Gresham on a number of occasions and I've sampled his nettle soup and eaten nettles in place of spinach. Despite Gresham's description of them (see later), I found the nettles quite palatable but rather tasteless and better with a dash of pepper! But you don't have to eat nettles. You can dine sumptuously on a wide variety of seasonal fruit and vegetables with only a small patch of garden to provide them. You won't need to buy fertiliser, weed killer, plant food or anything else like that. 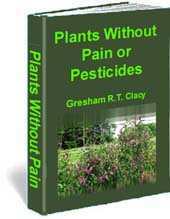 In fact the garden centres and big chemical companies will probably try to ban this book! When Gresham asked me to edit this book, I confess that I groaned inwardly. He "knows his stuff" but his punctuation is atrocious and I knew it would be worse than translating a German text (I've done that, too). However, the book makes such interesting reading that I found myself quite absorbed in it while making the corrections. Anyway, that's my excuse if you find any mistakes. The other excuse is that I didn't want to re-write the text because Gresham has a rather quaint, old-fashioned way of writing which would be spoilt by over-zealous editing. So, I've concentrated on making the text a little more understandable without (knowingly) changing the meaning or the "flavour" of Gresham's writing.